Football snacking and healthy eating don’t have to be at odds with each other when you’re cooking with Garlic Gold®. 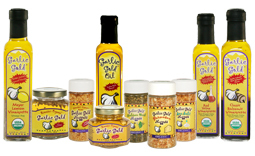 Our oils and nuggets add so much flavor to your favorite appetizers, you won’t even notice you’re missing the extra fat and sodium in traditional nachos. We’ve baked slices of sweet potato to golden brown perfection, brushing them with Garlic Gold® Oil for tons of of roasted garlic flavor baked right in. Out of the oven, they’re topped with black beans and avocados, drizzles of nonfat yogurt and hot sauce, and finally, a generous handful of fresh cilantro and crunchy Garlic Gold® Nuggets. You’ll love the riot of textures and flavors! Oh, and if you missed them, check out our other game day recipes for Cauliflower Buffalo Bites, Turkey Chili, and Guacamole. It’s a menu that’ll make you feel like a winner, no matter who you’re rooting for! Heat the oven to 425ºF and line baking sheet with parchment paper or a silicone baking mat. Slice the sweet potatoes into 1/4-inch thick rounds. Leave the skin on — it’ll help the rounds to hold their shape as they cook. Arrange the sweet potato slices in a single layer on the lined baking sheet, overlapping them as little as possible. Drizzle half of the Garlic Gold® Oil over the sliced sweet potatoes. Bake the sweet potatoes for 20 minutes, then remove the sheet pan from the oven, flip the slices over, and drizzle the remaining oil on top. Return to the oven for another 20 minutes, or until golden brown. Arrange the sweet potato slices on a serving platter in a nice, overlapping pattern. 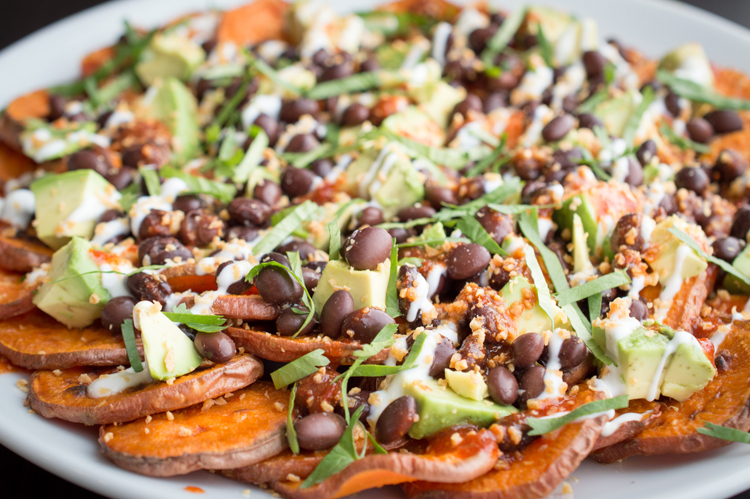 Sprinkle the black beans and avocado on top of the sweet potato slices, then drizzle on the yogurt and hot sauce. Finally, sprinkle on the cilantro and Garlic Gold® Nuggets and serve. Can’t wait to try TONIGHT! Looks really good. Appreciating the time and energy you put into your weisbte and in depth information you provide. It’s great to come across a blog every once in a while that isn’t the same old rehashed material. Fantastic read! I’ve bookmarked your site and I’m adding your RSS feeds to my Google account.